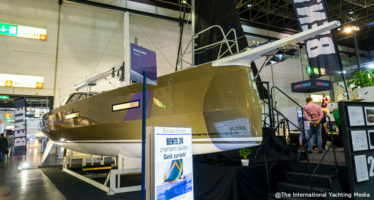 We talked about them in a previous article, now we have finally visited them at Paris Boat Show. 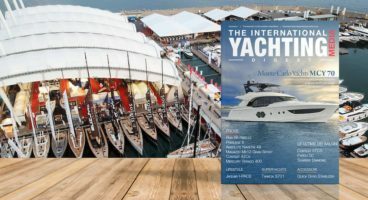 We’re talking about the two novelties that the Italian shipyard Ranieri International has introduced this autumn: the Cayman 38.0 Executive and the Next 220 SH. 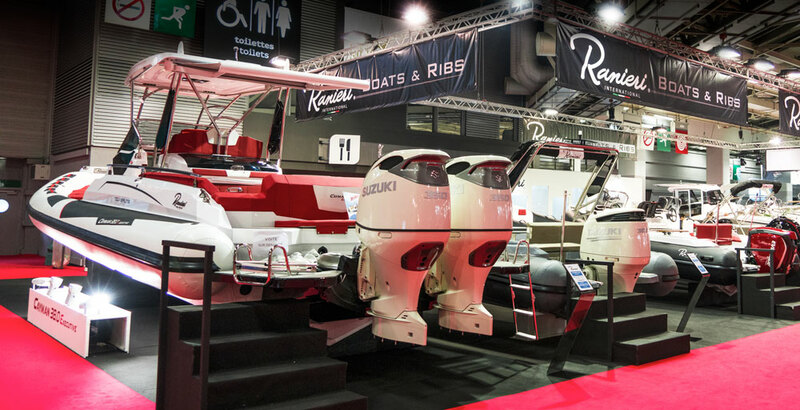 These boats are completely different from each other. 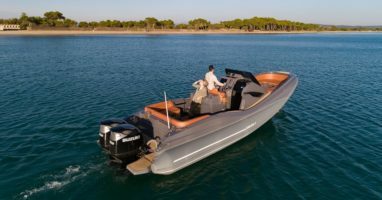 The Cayman 38.0 Executive is, indeed, a sporty elegant maxi RIB while the Next 220 Sh is a transportable fiberglass yacht with surprising spaces within just a little more than 7 meters. 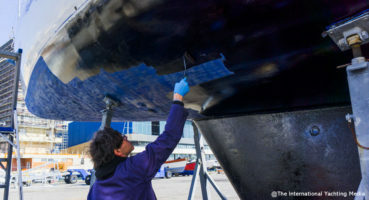 However, the two entries share special hull features (like the double step), excellent finishes and a wide range of options available. 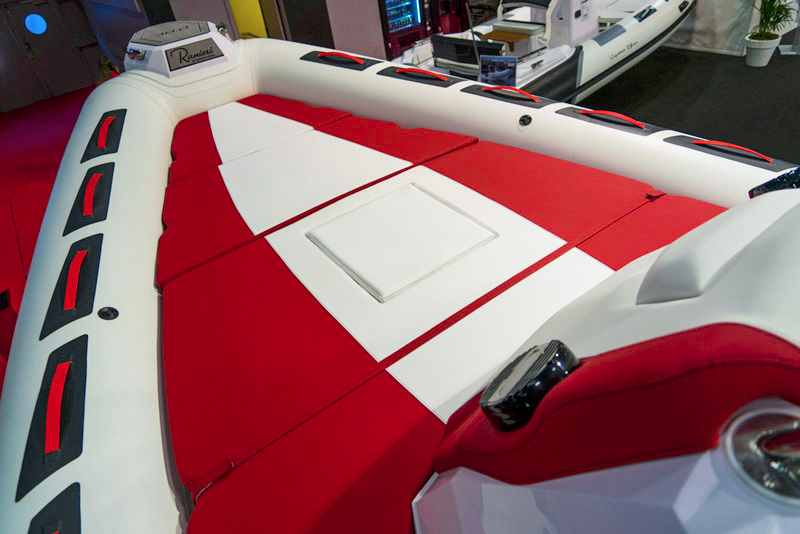 Taking a close look, the new flagship in the segment of Ranieri International’s inflatable boats is an impressive boat; more specifically, the version exhibited in Paris with red upholstery and central hard top has an undeniable visual impact. Thanks to design, a length of 11.70 meters and a width of almost 4 meters, the lines of this maxi RIB are also sleek and elegant. 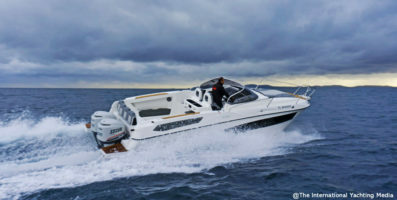 The Cayman 38.0 Executive can accommodates up to 24 passengers – a real record – for short-range day outings or 4 passengers for comfortable cruises since she is equipped with 2 large cabins, 4 berths, a bathroom, a kitchenette and an exterior fridge. 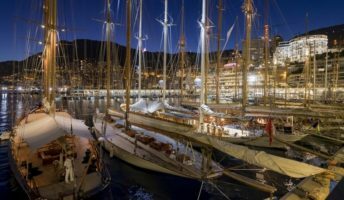 In order to enjoy more comfort, the owner can also demand for: air conditioning, boiler, bow thruster, a 2.5 Kw generator and even an ice maker. 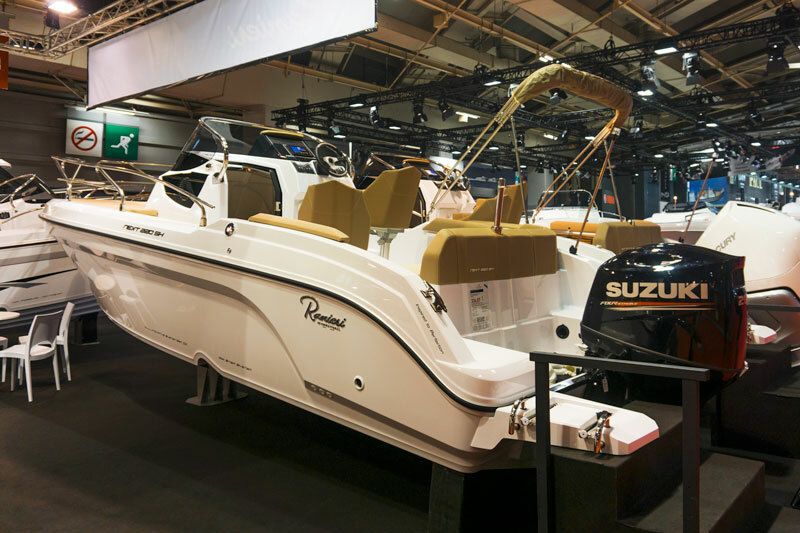 To think about a real cruise is not a mirage with this boat, considering the equipment and wide spaces available on board as well as the considerable fuel and water capacity of 750 and 150 L respectively. 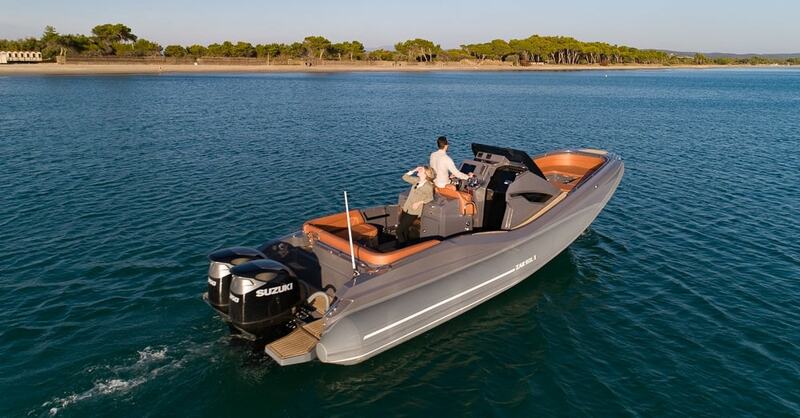 Anyway, the efforts of the Soverato-based shipyard to build an appealing luxury sporty boat have been really successful. The Cayman 38.0 Executive stands out for a considerable attention to details. 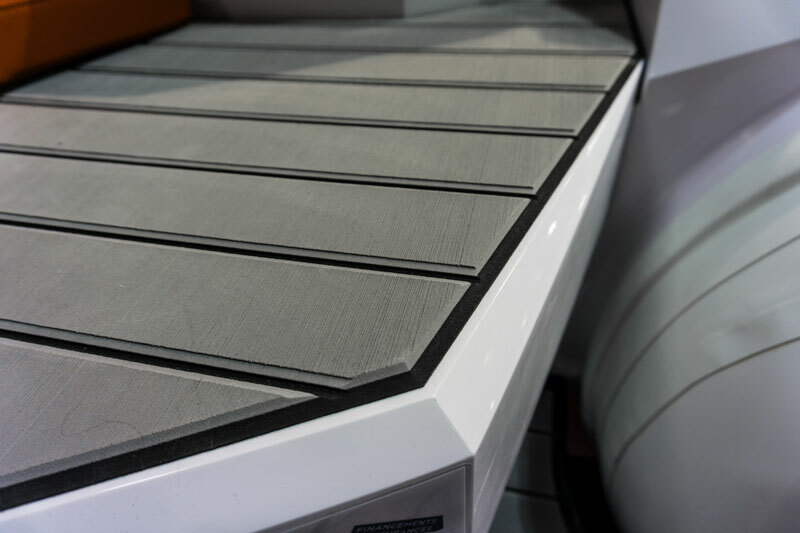 Details like 45-degree sea deck, blunted deck lines and coloured inserts suggest a certain building quality and sophisticated design. Nothing is left to chance. 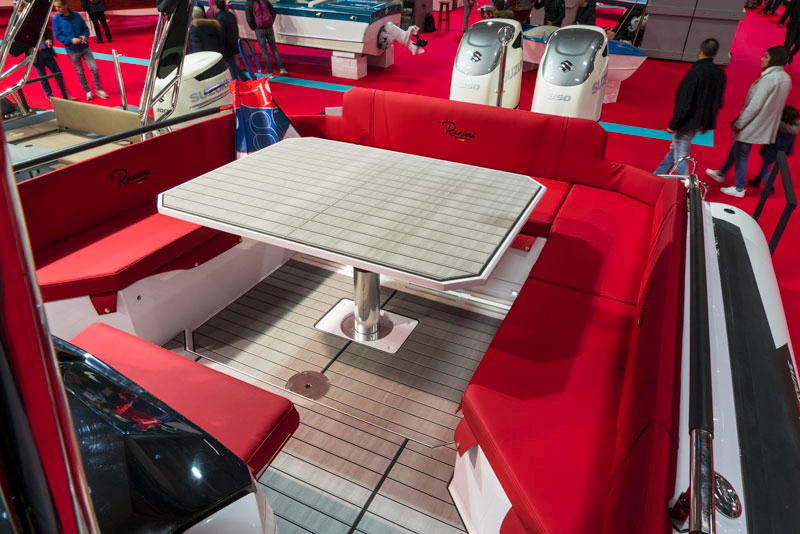 When arranged with the central electrically-operated table totally raised, the aft dinette can accommodate 7 people in total comfort while, when configured as a sun pad, it becomes a comfortable sunbathing platform for 4 people. When the table is in its flush position, the dinette becomes a large open space. 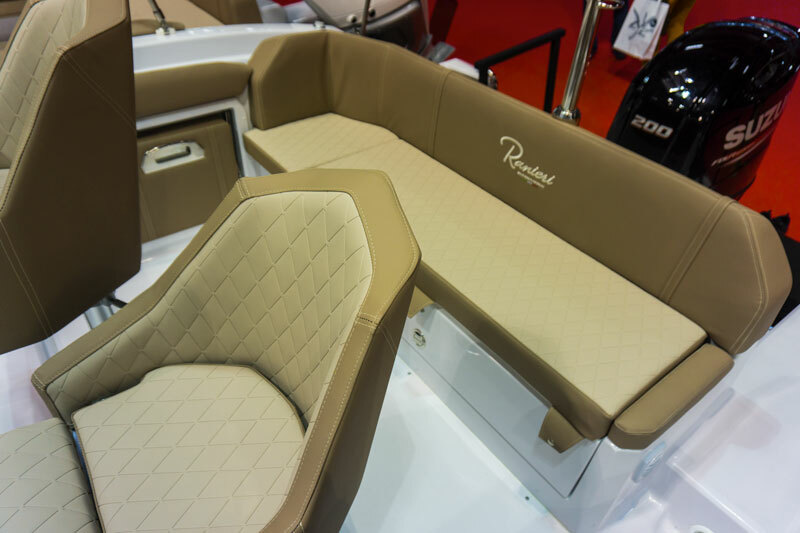 Equipped with a central backrest positioned next to the steering console, the forward sun pad is large and fitted with special stereo speakers. 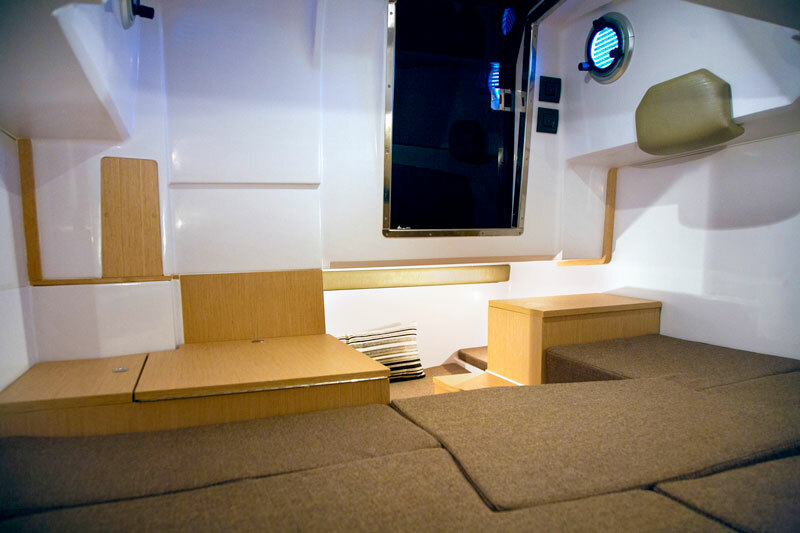 This area can accommodate 4 passengers in total comfort. 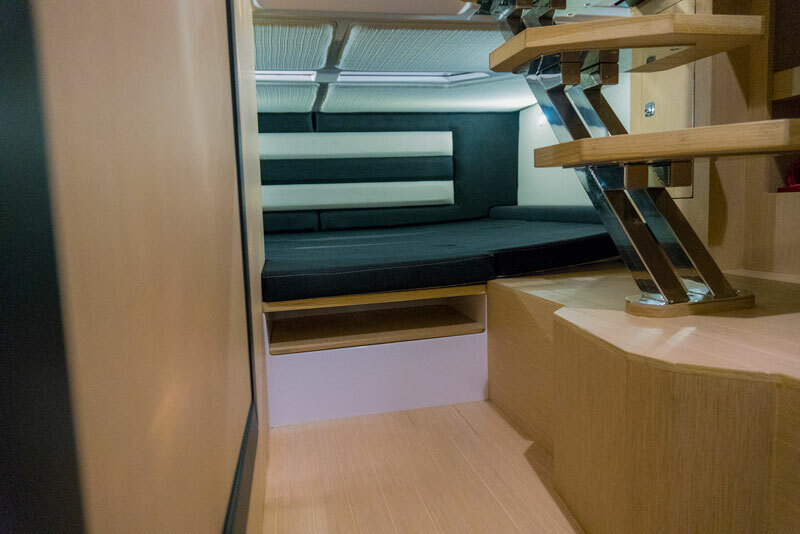 Below deck, interiors, too, amaze for their considerable volume and good space arrangement. These two factors have allowed to create two double cabins. The forward one is V-shaped while the other is positioned aft, below the cockpit. Despite its position, the latter is flooded with natural light by the large glass window at the foot of the steering console. Finally, on the port side, there is a bathroom with WC, washbasin and shower. 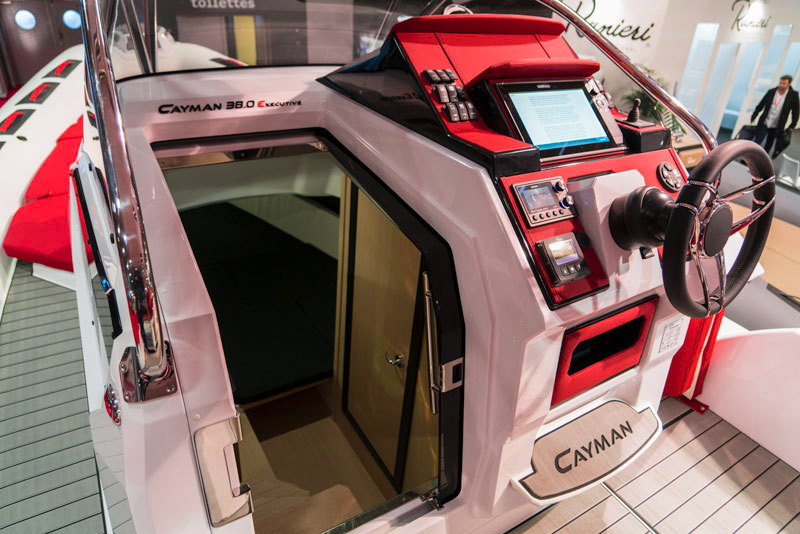 The Cayman 38.0 Executive can be fitted with 2 or 3 outboards for a total power of 1,200HP. 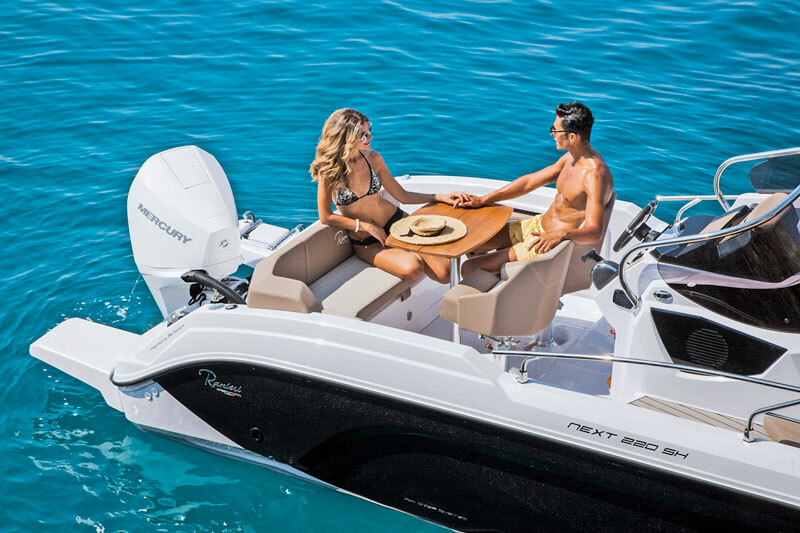 The most powerful engine option is really exciting and give a lot of fun without never sacrificing comfort and safety since the boat is equipped with a double-step HIS hull combined with the so-called Active-Suspension-System, a sort of suspension between the hull and the deck. 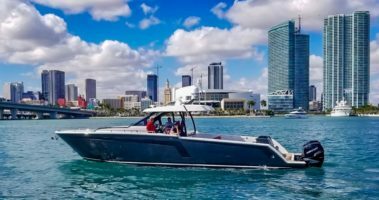 We hope to have the opportunity to test the Cayman 38.0 Executive at next Miami Boat Show, where she will certainly be one among the main players of Ranieri International’s fleet. 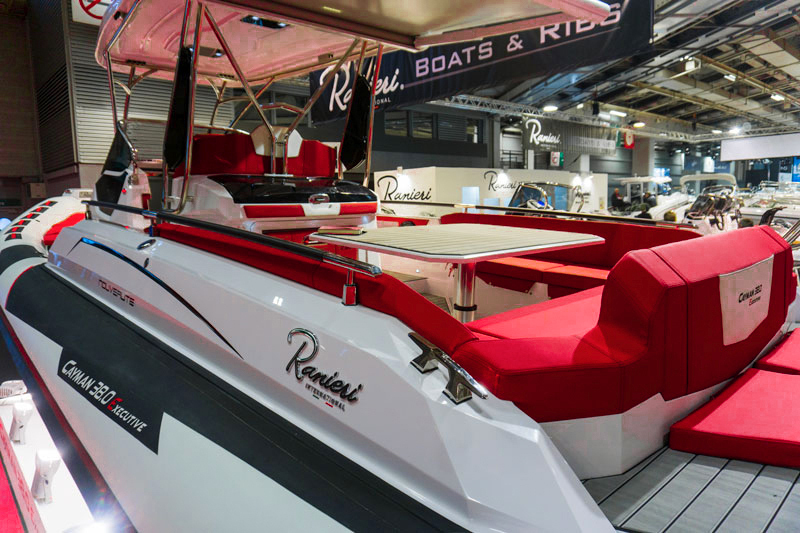 The entry level in the Next line is a fiberglass boat with an overall length of 7.35 meters, whose main feature lies in optimized interior and exterior spaces that are certainly above the average of the category. 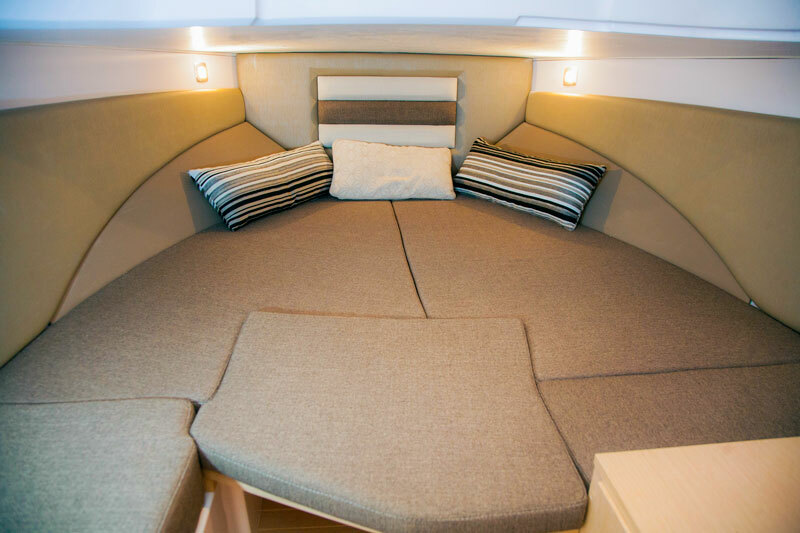 Climbing on board, we immediately realize that the aft dinette is unique in its genre and designed to seat 6 passengers, which is a real surprise for a 22-footer. 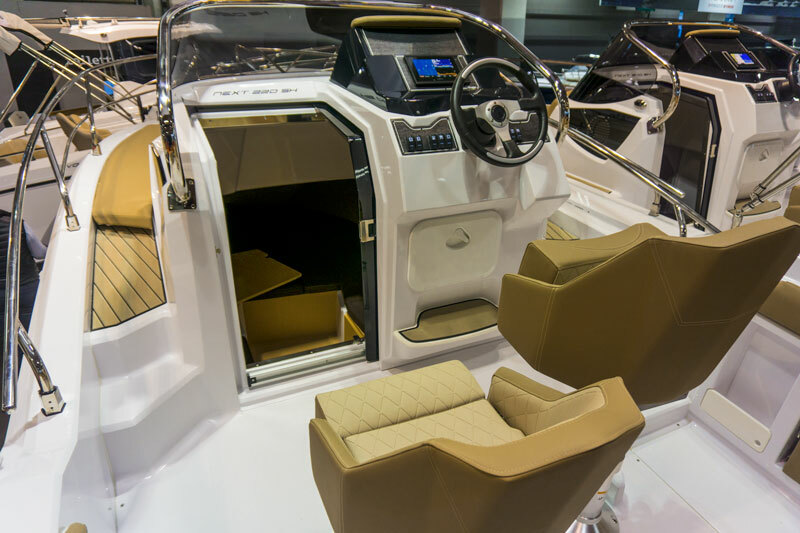 However, the designer has successfully integrated the seats of steering console with the dinette. 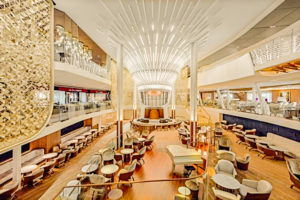 More specifically, the two seats can rotate and are adjustable in height, which gives guests the possibility to use them as table seats. 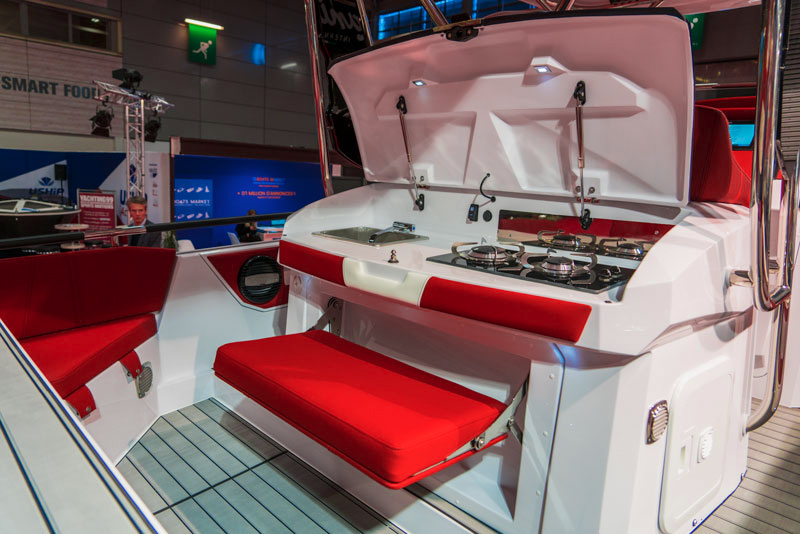 The other 4 people, instead, can use the aft sofa or the pop-up lateral benches. One of the many options available on the Next 220 SH, specially designed to improve comfort on sunny days, is the hard top. 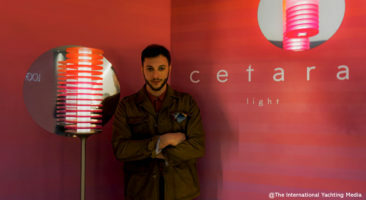 In addition, this makes possible the installation of a furling awning that, when open, shades the dinette area. 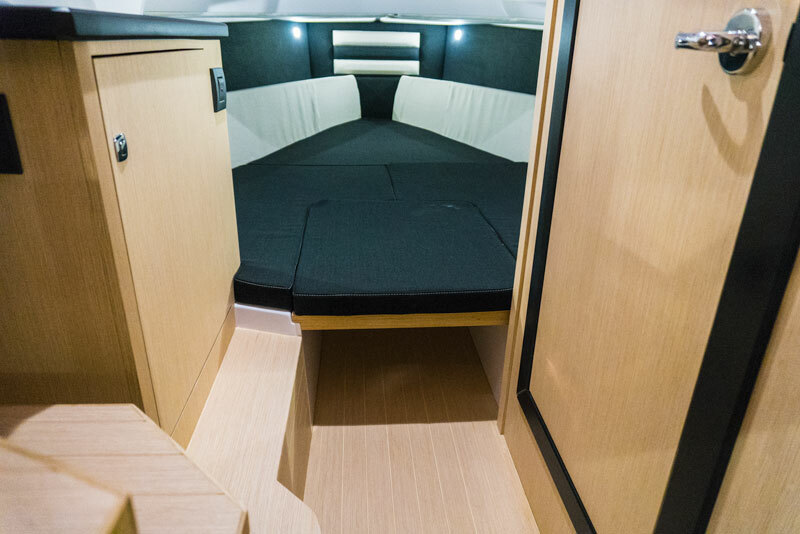 Another surprise can be found below deck where, in addition to the traditional forward V-shaped bed, there is also an additional single berth positioned aft, under the dinette. 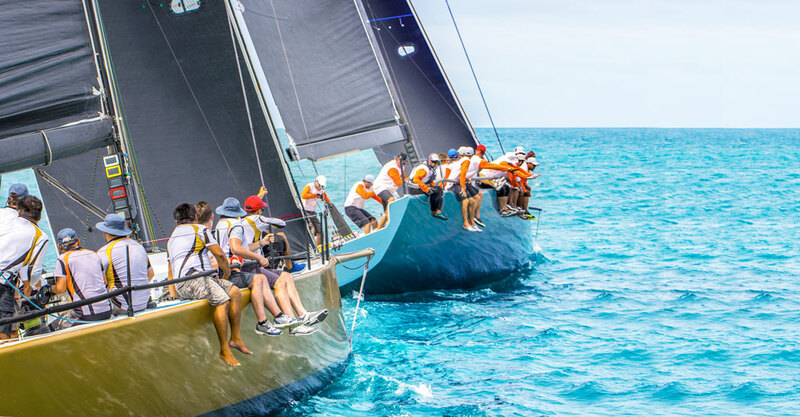 This is another “plus” for a boat of this size that makes it really exclusive. 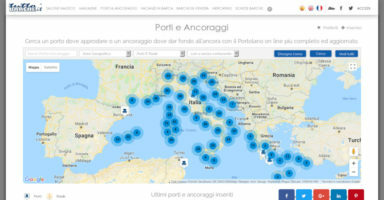 This solution is certainly very interesting for the families consisting of three people that want to leave for a short-range cruise. 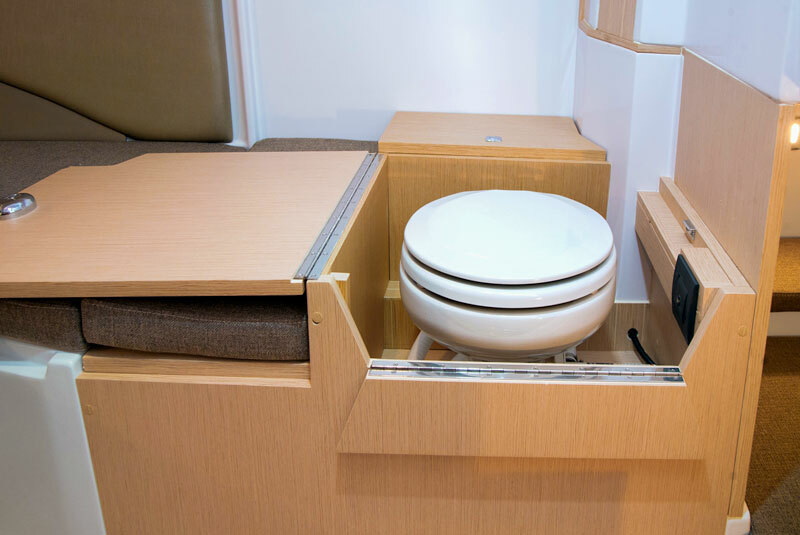 Moreover, the owner can choose to install a marine toilet, as you see in the picture below, in the port cabinet. 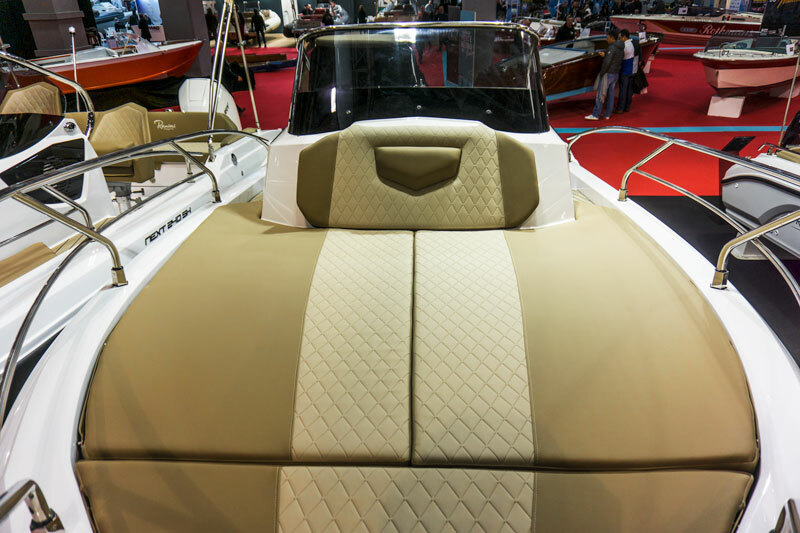 The Next 220 SH is the perfect boat for anyone looking for a small yet comfortable boat. 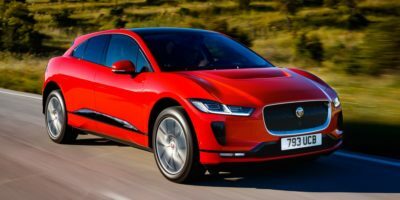 Price, too, is very interesting: EUR 31,000, engines excluded. 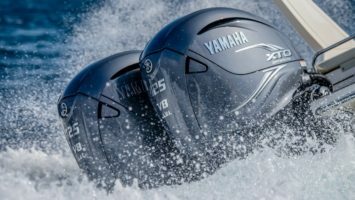 Power can come from single or dual outboards for a total of 250HP. 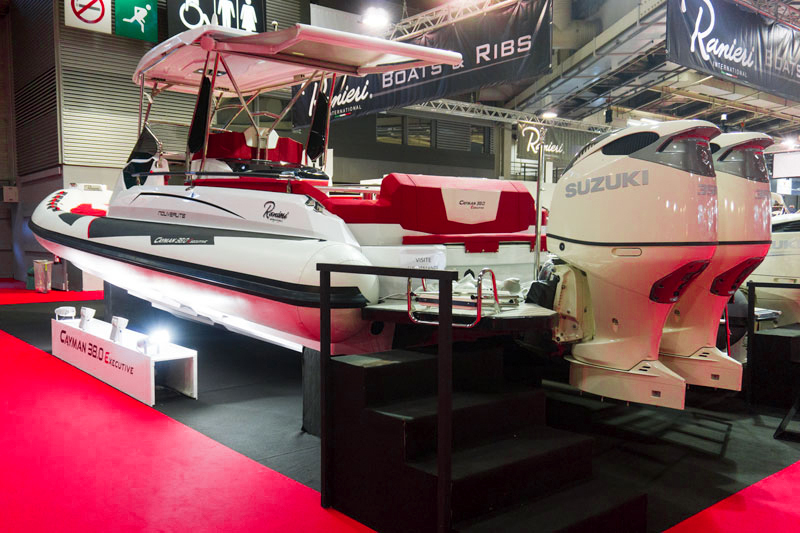 The model exhibited at the boat show, for example, was fitted with a Suzuki 200 HP outboard and offered for sale at EUR 54,000: a really good price for what this boat offers.